Adopting Nixon (formerly Jenny) has been one of the best things I’ve ever done. She’s such a good girl. She has great common sense. She can be off leash and doesn’t really stray. She only chews on her toys. She eats when food is out. I work as a lawyer in tv and am the attorney for “who wants to be a millionaire”. She had full run of the studio this summer in Vegas. She was loved by the entire crew and the contestants. "June (formerly Marge) is doing great!! She's gaining more confidence each day. We started larpo training and we all really enjoyed it. She's going to be an awesome ambassador for her breed. We hope to have her become a therapy dog and she can bring comfort to the elderly at nursing homes or visit children at the hospital. She's very intelligent and also quite stubborn, but we are all working through it. She brings us so much happiness and our hearts are very full. " "While time does fly, Finnley (Wilmer) has already become such an integral and special part of our family. We have had the pleasure of watching Finn develop and grow from a timid pup to a curious, independent boy who is getting bigger by the day. Finn has taken leaps and bounds in training at LARPBO and we are blown away at his eagerness to learn and train with dogs and people alike. Finn is a sweet sweet boy who enjoys snuggling with his moms, having all the pillows to himself, stealing his sister's toys (even when he has the exact same one) and post meal zoomies. We couldn't be happier to have Finn in our lives and be a part of his bright adventure filled future." Dizzee (ChaCha) has become the center of our family. She loves having people over, especially her grandparents and great grandmother. Dizzee is always sitting on someone's lap or trying to play tug-of-war with her favorite toys. She loves going on long walks and has really opened up at the dog park recently, enjoying herself there more than ever. Her favorite activity by far however is running after her dad in the sand at the beach. We are so lucky to have found her and for Wags and Walks taking her in! "Remy (Kona) is the greatest thing that has ever happened to us! She was the first and only dog we met on our journey to adopt and I was terrified we were making an impulsive decision but Wags and Walks promised us she was an amazing dog and that it would work out and they weren't wrong!! She brings so much happiness and joy to our lives." "Time really does fly when you are having fun. Arya (Charlotte) has brought the most joy to our home. We love her so much and don't know how we went about life before her. Thank you for all you do to give sweet angels a forever home! Arya (Charlotte) is a very friendly and social pup. She has made countless friends in our neighborhood and at the dog park. And we have to admit, we too have made more friends because of her. Arya (Charlotte) completed her puppy classes and has picked up on many commands. She is smart and we are thrilled to see her learn and do more as she matures. Life has been much sweeter with her in it and we are grateful that we have her in our lives." "We love June (Meadow) so so much. We can’t believe it’s only been a year since she became a part of our family - we can’t imagine life without her. Watching her grow into the confident and loving pup she is today was one of the most enjoyable aspects of our life last year. It was the happiest accident that we walked by your event last summer and we have been grateful to Wags and Walks everyday since. Thank you for all of the hard work you do!!" "Shadow (Sage) has adjusted well and while still timid with humans, now is very social with every dog in the neighborhood and loves playing. She has gone through 3 weeks of training and now knows how to sit, lay down, and shake! We love her so so much." "2017 was a year when I lost both my beloved Ed and Slim Jim. They’re just dogs, some people may say. Maybe so, but for some of us they are family. When they pass, we mourn them deeply like when human loved ones die. You smile through the sorrow and move on. I moved on and in the process I opened my heart to another dog in need. It’s also this year then that Macaroni (fka Charlie) entered my life. I didn’t rescue him. He rescued me and put my broken heart into one piece again. With him by my side the future looks bright. I’m rediscovering unconditional love, patience and compassion." "The best part of being a doggy parent is spoiling Zoe and seeing the excitement in her when I come home. Being a person that was born and raised in California I never enjoyed going to the beach as much as I do now, Zoe my two kids and I walk along the beach any chance we can." "At first so timid and unsure of herself or her place in the world, her ears were back and her eyes sad but hopeful. Now, look at her - confident eyes, happy ears, and still her sweet sloppy sit. She is living a great life and thought you’d want to know! Oh and she can hold two balls in her mouth!" "Whoopi (Sagittarius) is doing wonderful! She is the sweetest ball of energy and we are so in love with her. Recently she was an intricate part on Chris's proposal to me and the cutest little bat on Halloween that ever existed. She's healthy, happy and full of love. Thank you for taking such good care of her in her first few months. " "He's been the perfect addition to my life and I love him so so much! He's adjusted quite well and comes with me just about everywhere. He's become quite the celebrity with my friends and family." 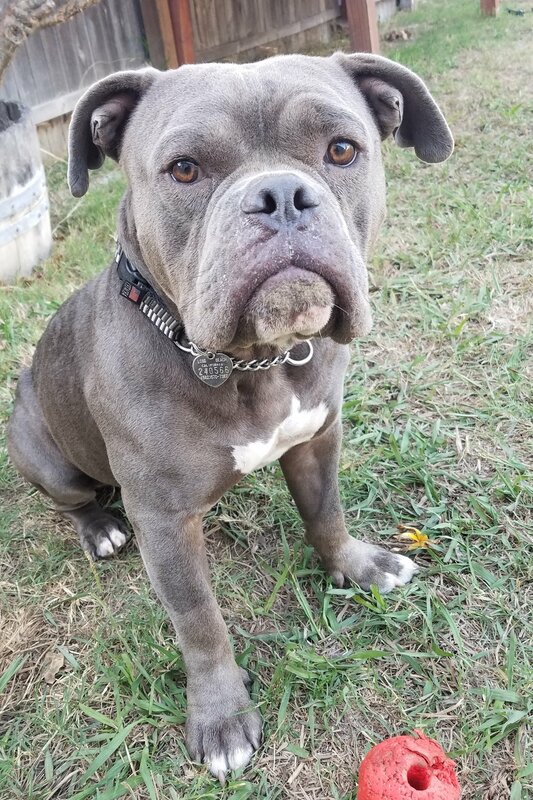 "I wanted to send an updated picture of our sweet pup Archer. We adopted him from Wags n Walks back in November and he has been such a wonderful addition to our family. He is now 10 months old and happy as can be. This picture was taken recently at his doggy day care, they love him there (we don't blame them)." "Zoey's (Morticia) coming up on her first year in her home. She's come so far. She was anxious at first now she's well-adapted and we're still learning about each other. We are so happy Zoey's chosen us as her family. "In August 2015, mild-mannered mutt Bagel became a family pet for ProSocial’s CEO, Meredith, and her husband and their two boys, soon after an animal rescue organization in Los Angeles, Wags & Walks, found the dog living on the streets and determined she’d been deliberately abandoned by her owners. She immediately became an integral member of the ProSocial team and comes to the office nearly every weekday." For more of Bagel's story click here. "Lilikoi (formerly known as Penelope) and I are doing amazingly well. You guys have changed our lives! When I was looking to adopt, many places turned me away because I am not able to bring her to work with me. I have tried to explain to these organizations that I have the means to hire dog walkers and/or take the pup to doggy daycare while I'm at work. No one would give me a chance. But your organization and your staff did, and I'm forever thankful. I can't imagine my life without her. So, thank you a million times and over for helping us find each other." "I'll be in my suite at Chateau Marmont if anyone needs me." 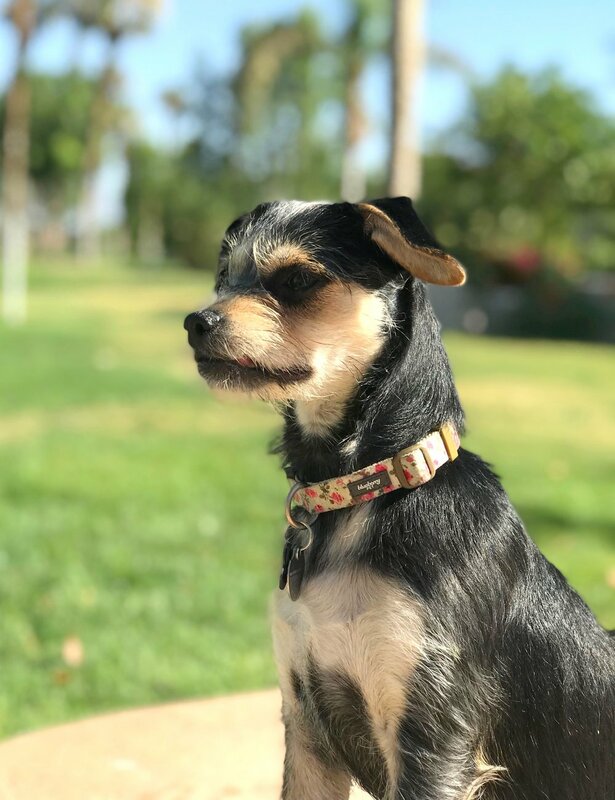 Our alumna Olive was featured in Wunderdog! Check out her article here. "Mona and Marty are great. We love them to pieces and they have been the perfect additions to our family. This week will be their first trip to the beach! Very exciting. And, you'll be happy to know that they are both in better physical shape these days. Shedding the pounds!" "We're completely in love with George (Denver) and he's made himself right at home in our little family! He's turning 9 months old soon and he's such a cuddle bug. He loves to play fetch and tug of war with his toys and has mastered some awesome tricks. He's super smart! We're moving to a house next week and can't wait for him to have a backyard to play in!" "Tosh is doing amazing! And is one of the best decisions I've ever made. I can't even remember what life was like before him. He is the sweetest, most fun loving puppy you could ever meet. And anyone who comes in contact with him falls in love immediately." "Leila is my true soulmate. Thank you for bringing her to me!!!! She is constantly by my side, and is a piece of my heart!!! I love my baby girl. Forever grateful!!" "It feels like we've had Popcorn (formerly Mabel) for all our lives. She's totally our little baby and now we wonder how we ever lived without her. She's the snuggliest dog I have ever met and gives very thorough face licks. Everyone wants to know what she is and where she came from - no one believes that she's full grown. Our vet calls her a professional puppy! Thank you so much for bringing her into our lives and for the work you do with all the other pups." "Thank you for reaching out! Pizza (formerly Basil) has been the best thing to happen to us I think EVER. I know every dog parent thinks their baby is a unique snowflake, but Pizza really is special and I would say objectively the best dog who ever has or will walk the planet. I've never met a dog with so much personality and who is so driven by pure love! Our last year has been filled with a lot of cuddles, long hikes, games of chase, cuddles, learning a ton of tricks (she's beautiful AND smart! ), being gushed over by strangers, and more cuddles. Pizza is giving me sad eyes because she doesn't like when I use my phone, so time to sign off! Thank you for bringing this wonderful ball of love into our lives!!" 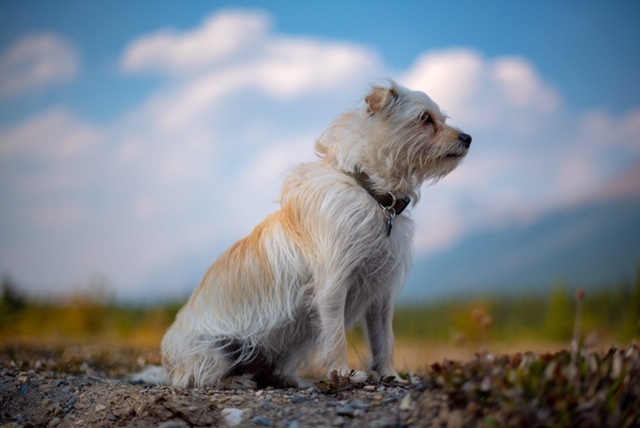 "Lexington is a wonderful dog, we adore him and still wonder how we got so lucky to find him. He is gentle, kind and playful, we couldn't be happier." "We adopted the super sized beautiful puppy named, "Patriot," 2 days ago from NKLA. As for Mr. Patriot, he is as comfortable as if he were born here. He was a bit timid when we met, for about 1 hour, then he was all kisses and snuggles. He loves to play, or I should say he LOVES TO PLAY, and has been introduced to all of the neighborhood dogs which he found very exciting. He's been toy shopping and already has a favorite. He also chose a bed at the store, but he prefers the sofa next to my bed instead. He is very intuitive. I have MS and require a cane. He doesn't yank, or jump up as would be very natural for a large breed puppy. As young as he is, he actually walks just slightly ahead of me, and sits patiently until I catch up. He is completely non aggressive towards my cat and communicates well with my son who is speech and hearing impaired. We could not have found a more perfect family member. He is going to our summer home in Cape Cod where he will enjoy his own private 1 acre yard and lake, along with miles of walking trails. We absolutely love him and are super happy that he seem to love being with us too." "Oliver is the most amazing dog. He was the star of a "Senior Service" Street Fair in West Hollywood--where he stayed on my lap at the table--saying hello to anyone who would look at him. 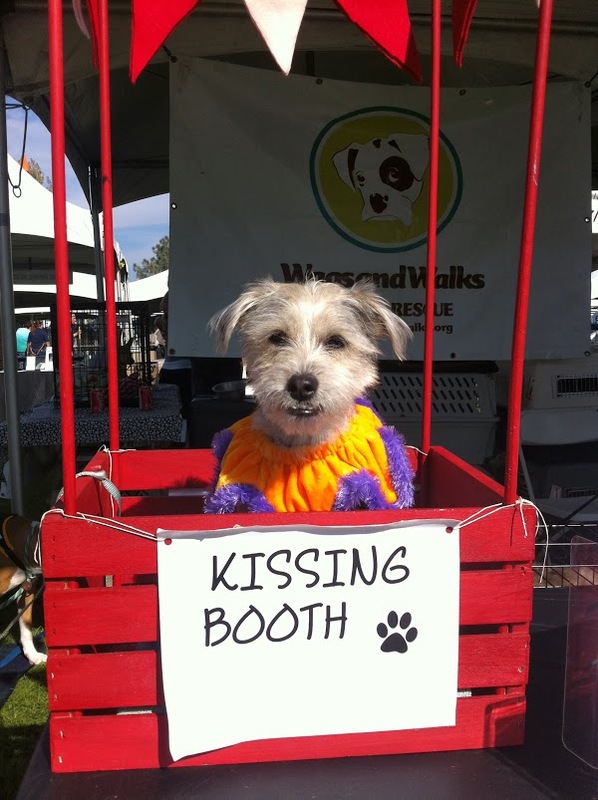 He has never stepped out of the kissing booth. He is priceless--thank you for saving him for me." "He is now living on Kauai and absolutely loves the beaches and beautiful warm weather. We go on daily adventures around the island! He's the most perfect cuddler and won't move all night. He loves everyone and always gives them a nice warm smile with his teeth! Thank you for blessing me with this amazing boy!" "Fig is doing SO great & has adjusted to his new life so well... We took him on his first hike last month & I had to include a picture because he just looks so ridiculously happy." "Olive passed the AKC Canine Good Citizen test and became a Therapy Dog! In September she began working two days a week at a therapeutic school for children ages 10-18 who have significant mental health concerns. She loves climbing into their laps as they struggle with academic work, offering reassuring licks during group therapy, helping them through transitions, and brightening up their days with her growing repertoire of tricks. Many of the students have made significant strides with her help; watching the transformation has been an incredible experience for myself and other staff. I cannot thank you enough for rescuing my girl. The last seven months have been a spectacular journey for us both." "I can't say enough good things about Wags and Walks who brought me together with my beautiful 4-legged daughter, Dottie Mae."